Crafty escapism: 7 pieces of white bunting done! It was Knitting Natter at the Victoria on Sunday. Almost didn't go... was in a grumpy mood. But my friend Sharon & I exchanged texts and persuaded each other. Had a fun evening. Same group of nine ladies. Sarah was knitting breasts for a breastfeeding support group - made me laugh! 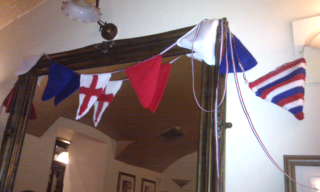 We were shown the required jubilee bunting and given wool and a pattern. I took 100g of white acrylic dk, Sharon and Sarah the blue and red balls. After two pieces of stocking stitch with further edge on 3.25mm needles I doubled up the yarn and switched to chunky needles. Finished with two moss stitch pieces - moss stitch doesn't roll so won't need to be ironed flat and texture is pleasing.